Have you ever heard of Piedmontese cattle before? Well, I had not until last week but am happy that I found out about this type of beef. This breed of cattle originated in the Piedmont region of Northwest Italy, well known for its wines. The Piedmontese breed is unique as it has a certain genetic marker that enables the cow to grow more muscular tissue with less marbling. This provides you with a meaty cut of beef that is very low in fat. In addition, the Piedmontese cows are grass fed resulting in beef that is better for you and tastes amazing. Elyse from The Organic Butcher of McLean reached out to me last week to help them promote Piedmontese beef for the upcoming Columbus Day weekend. I am so happy that I did as this Piedmontese beef will be in my regular rotation! Now sit back, grab a glass of Barolo, and enjoy this post for Piedmontese Beef NY Strip. Prep for this type of beef is the same as any other: I took the steak out of the butcher wrap, rubbed it with EVOO, covered it with salt and pepper, and let it come to room temperature as I lit my Big Green Egg. As this beef has less marbling and lower fat I took the opportunity to get some Black Truffle Butter to serve on top of the cooked steak when served. In addition, I couldn’t pass up this wonderful bunch of Organic asparagus. I preheated the Big Green Egg to 600° in prep for this direct cook. One thing to note about Piedmontese beef is that it cooks faster than other types of beef (>33%). As a result watching the steaks carefully as they cook is recommended. For this cook I seared the NY Strip for 4 minutes each side and got a perfect medium rare (130° internal temp). As the steak rested I placed a nice sized dollop of the Black Truffle Butter on top of the NY Strip. I grilled the asparagus direct for 5 minutes and served with the steak. Piedmontese Beef surpassed my expectations for both taste and presentation. If you have the opportunity, try this for yourself as I give it my hearty recommendation. Until we eat again… cook something good for me! This looks absolutely amazing, Chris. 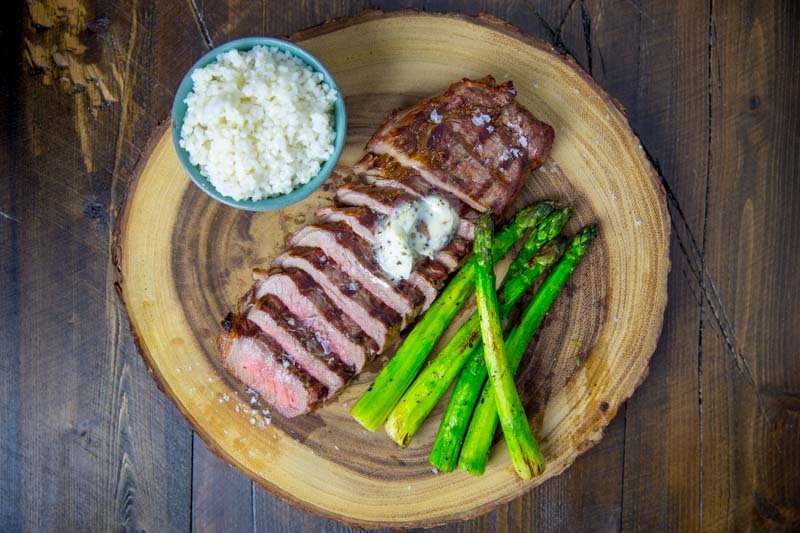 The Organic Butcher website appears to only deliver locally, so I checked a few local butchers including a local Omaha Steaks to get my hands on some, to no avail. What would you say it compares to in texture? I dont see the marbling, but just by looks it almost seems to have a Wagyu-like texture after cooking. Cant wait to try this cut. Thank You! It was amazing. The texture is amazing and not dissimilar from prime aged beef. Really delicious considering the low amount of fat in this type of meat. So glad to see your review and presentation on Piedmontese Beef. We raise these wonderful animals and are beginning to sell local in the Dallas market in 2017. One of the best cuts of beef I have had. I am excited for your business and wish you great success!